The house that just a year ago looked like it was ripped out of the movie The Ice Storm, or the 1970s in general, is almost through its remodel. 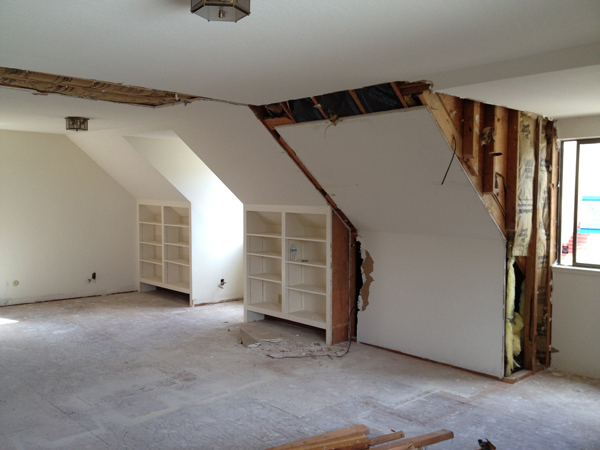 I skipped a portion of construction with sheetrock, exterior work, etc…to this 11th hour. Approaching now a more prominent -and 0bvious– entry to the house on concrete pavers and plantings that will eventually fill out the gravel gaps. You can barely make out orange peels on the front stoop, from a Feng Shui house-blessing that had just taken place. 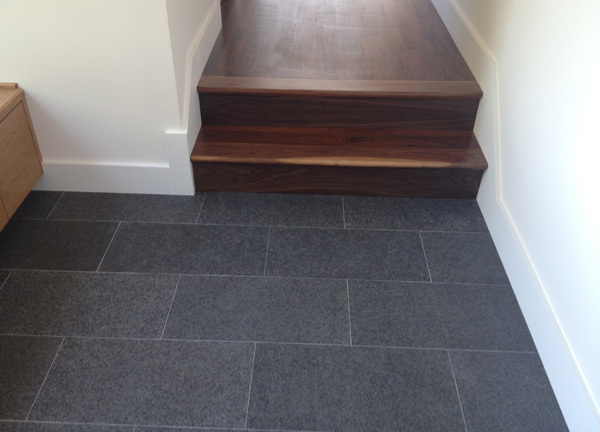 The 12×24 stone pavers on the front stoop continue in to the entry to create a mud zone to take off your shoes, and transitions to the walnut throughout the house. A view through the main hall past the kitchen to the sunken living room beyond. The glass panel rails continue from the first floor to the third. 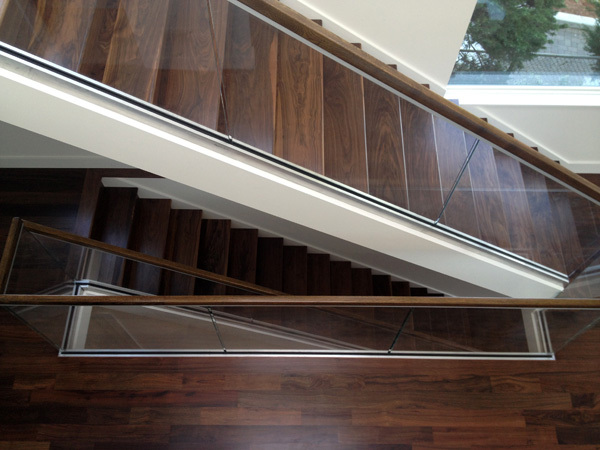 The glass rails are finished with a wood cap to match the floors. 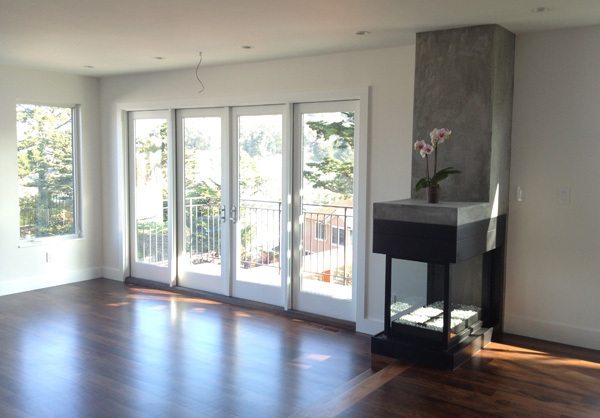 The living room doors and sidelights, next to a peninsula fireplace that straddles the steps to the dining room. Let’s turn around and look back toward the front door. That’s a weird red thing smoke detector on the ceiling. (I really just wanted to use the ‘strike’ feature, which seems to only allow red text. WTF?) 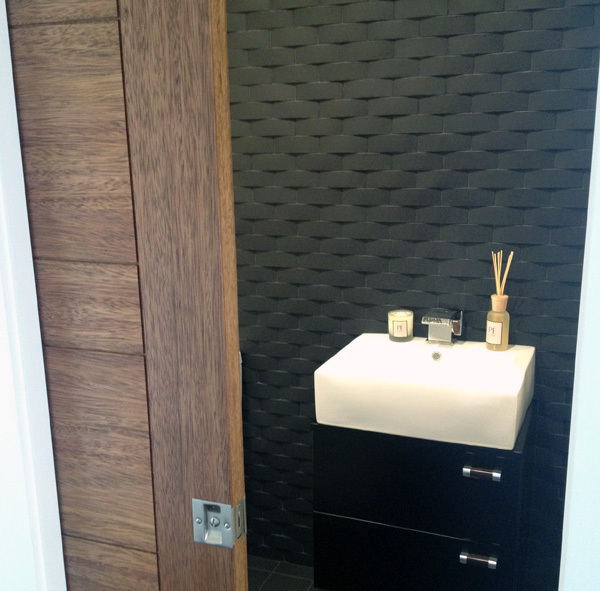 A small powder room near the entry was tiled in a black basket-weave pattern from Ann Sacks, to give guests something interesting to look at other than their reflection. 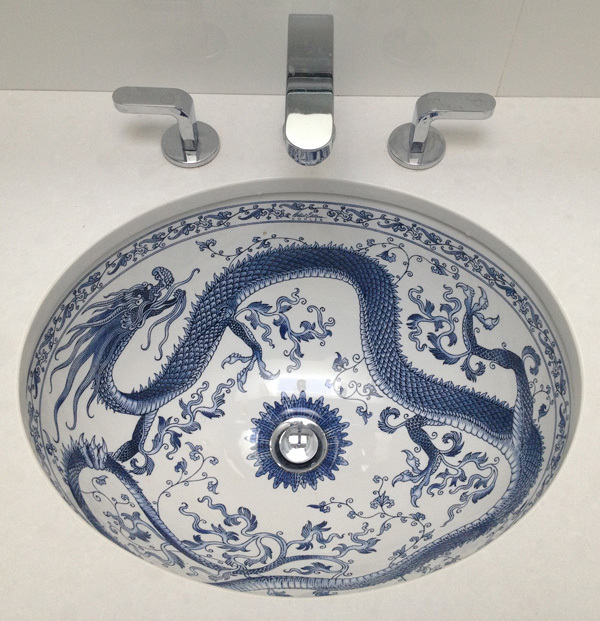 (there’s a small mirror to the right) The dragon sink below was selected by my clients’ son for his bathroom, so we used a lot of blue in that room to match. 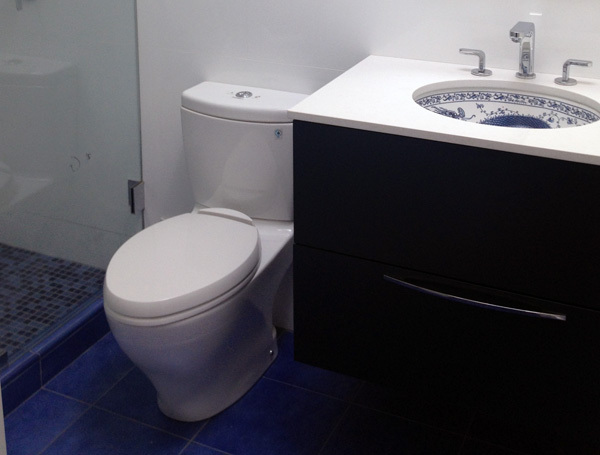 The cabinet is dark blue but it’s hard to tell in this photo.. Their daughter’s bathroom shower has ‘Ming Green’ marble tiles also from Ann Sacks, and white / greige on other walls and floor. I like this bathroom scheme the best of the four in the house… The master bathroom is dark, with a recycled concrete tile by ‘Revolv’ on one shower wall that reminds me of old 45 records. 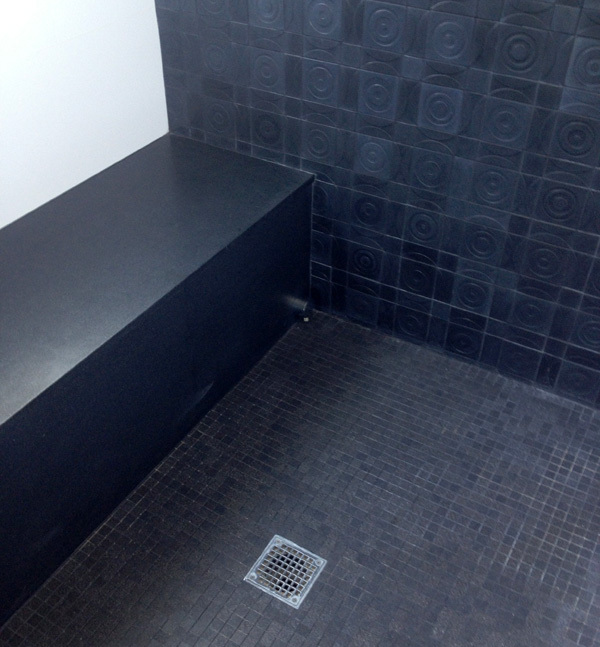 The bench was covered in a countertop material at the urging of the contractor even though I’d called for 24×24 tiles from the same line as the floor mosaics, but he insisted, warning of potential leaks (!?). Form vs function as always! 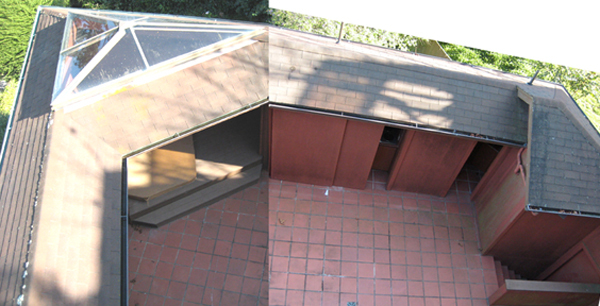 Looking down from the master bedroom balcony to the patio below. 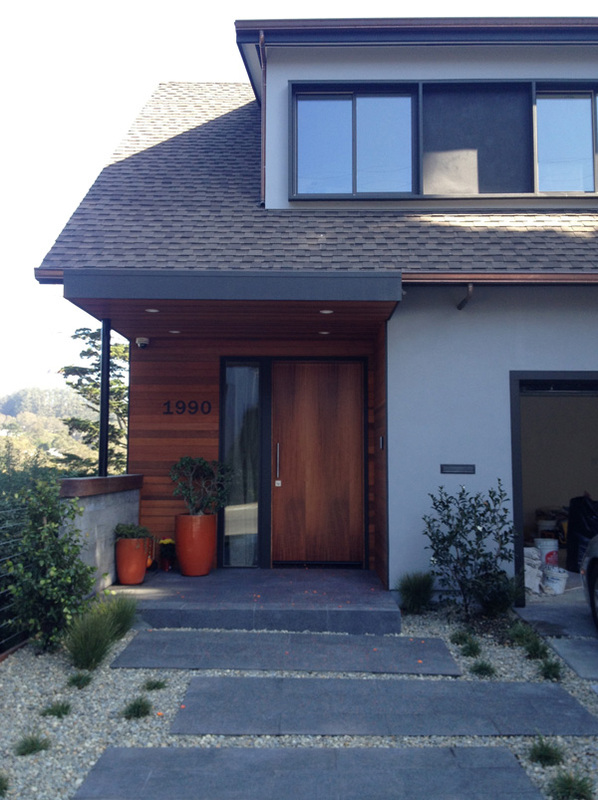 The exterior design was a collaboration with my friend Jared Vermeil – visit his site here. Jared actually introduced me to this project – a huge thank you to him! 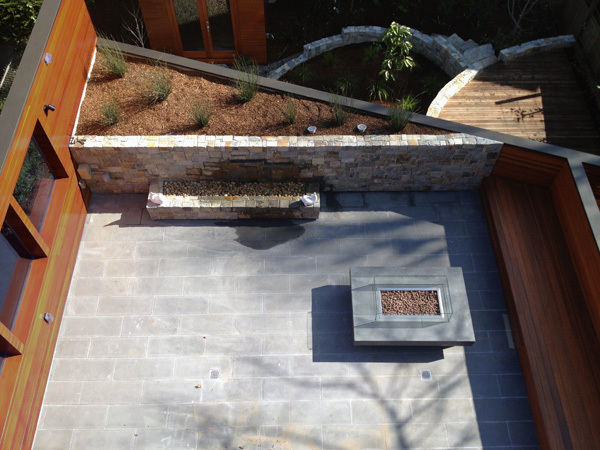 There is a water feature, gas firepit, bench seating and planted area at the patio. 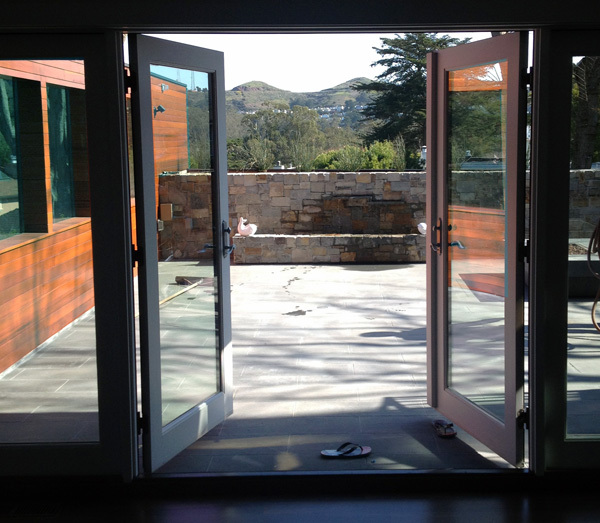 Steps lead down to the rear yard with a small wood deck and meditation hut. 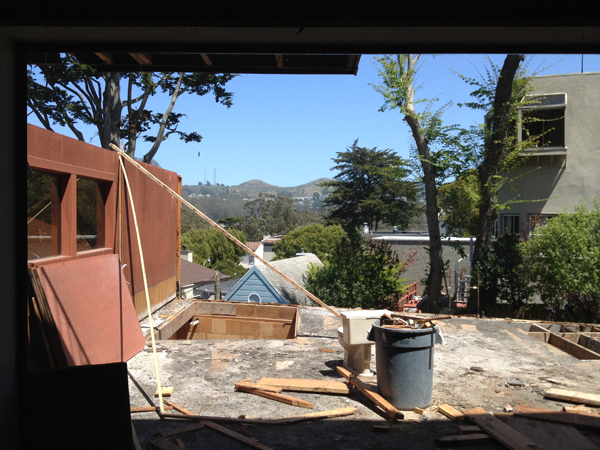 The sharp angle of the patio is taken off the rear property line. As for that glowing orange wood, I’m not happy with the color, and I can’t wait for the elements to tone it down to something more soothing. Good thing it’s south-facing – bring on the UV! 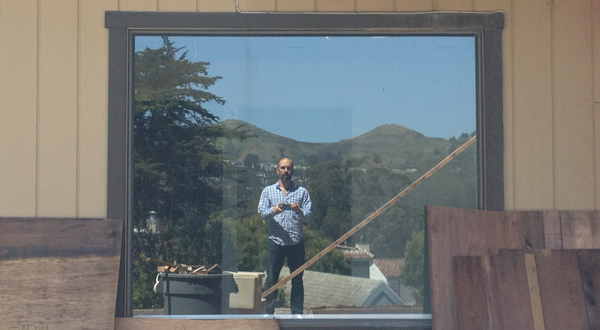 Even from the first floor, the view to the backside of Twin Peaks is pretty sweet. This is an enviable outdoor space that will see many parties in years to come, hopefully I’ll be invited to one or two : ) — more to come, once I get it pro photographed and up on the website. There’s a light at the end of this tunnel*…this is a skylight shaft over one of the bathrooms. Bright & cheery it will be, a nice place to put your face on morning or night. The house is insulated, and sheetrock has arrived for install. French doors & sidelights in the living room looking out to the deck. 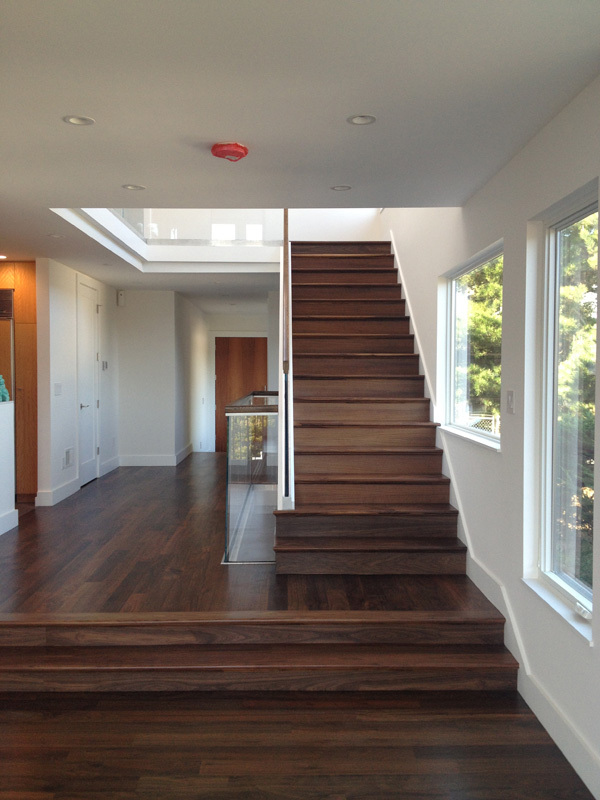 Above is the ‘peninsula’ gas fireplace that sits between the living and dining rooms, and the temporary stair – ladder. 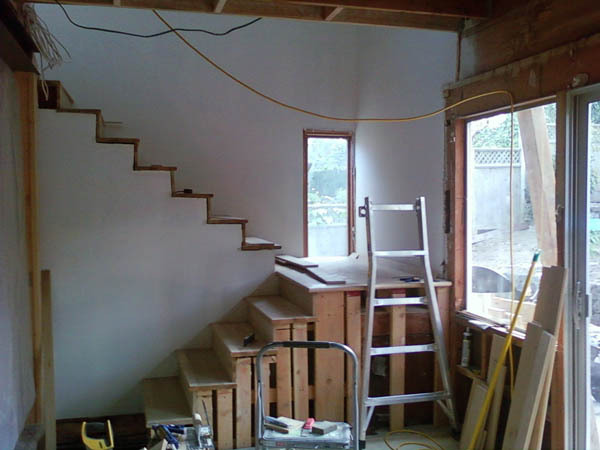 Here is the upper run of the stairs being installed. We used a steel stringer to attach the aluminum CR Laurence base ‘shoe’ for the glass railings that will go up both flights of stairs and around the balconies. The shoes (silver strip toward bottom of pic) have to attach to steel, from what I know. A close-up of the shoe on the upper balcony. It’s attached to the tube-steel that is bolted to the wood PSL, so that the shoe will be aligned with the flooring and it will look (fingers crossed) as though the glass starts from the floor with no support. Jumping ahead a few days here is the stair with treads initially installed. I had pushed for an open-riser stair in this house, since you walk in and see the bottom of the stair from the front door. 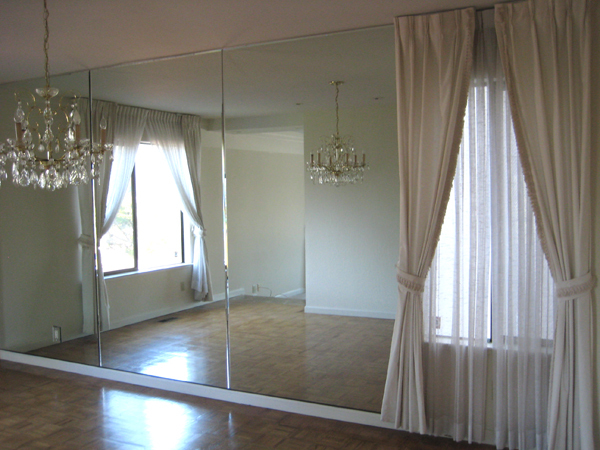 But I was overruled by the Feng Shui consultant, who explained that energy would flow right through with nothing (such as risers) to stop it. So we have risers. 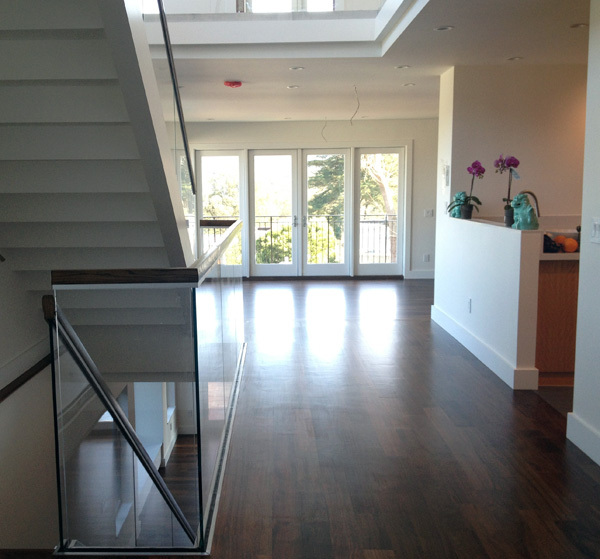 A view from the living room toward the front door and up the stairs. 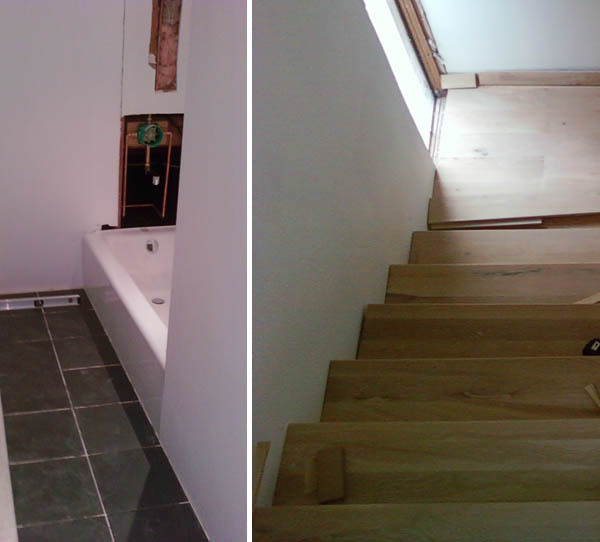 We originally were to have a low wall or railing at the square landing bottom of stairs, but decided to nix it and extend the bottom step all the way across so you can walk up or down into the room. A view from the park next door. We painted the bay window entirely the same dark bronze color as the windows. The window layout is original on this side. A view from above the house you can see the solar panel standoffs on the flat part of the roof. On the left is the new shed dormer at the front. 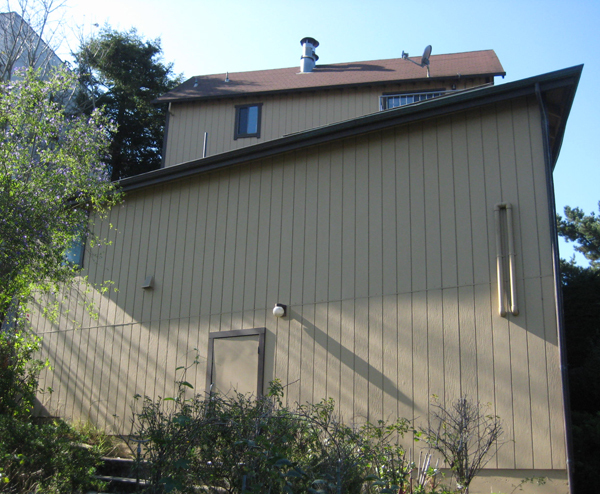 Here’s the shed dormer that replaces the 2 former hobbit dormers. 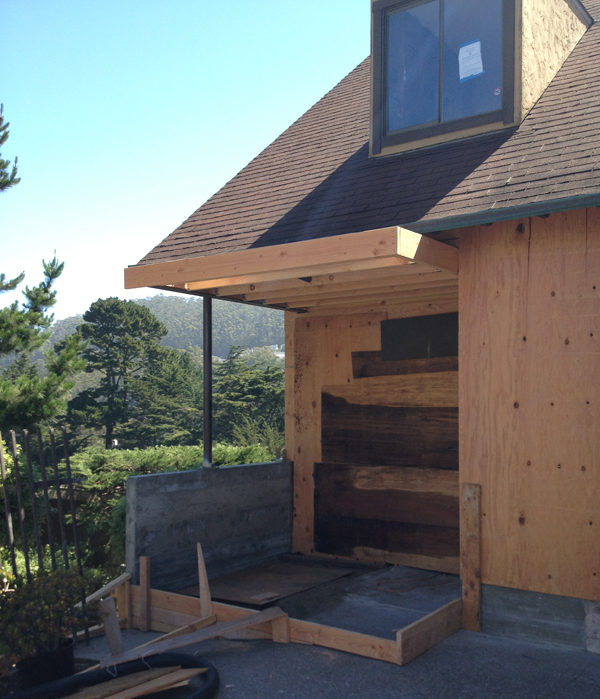 At the back of the house the new stucco siding is going on, and in the yard we have a small shed / outbuilding / meditation hut. Much more to share – stay tuned! *There is indeed a light at the end of the tunnel – we are determined to have the owners moved in by Christmas. ho ho ho! 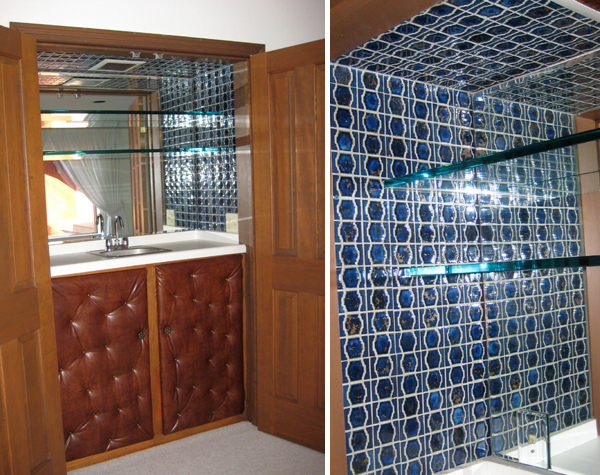 We don’t mind this though – the wet bar! It stays. (there are two of them in the house…) The awesome tile, and the padded cabinetry so you don’t knock your knees when going in for cocktail no.4. 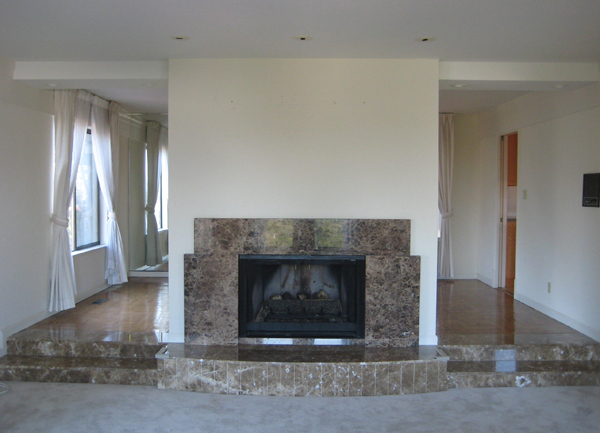 A second fireplace – leftover stone from the facade? 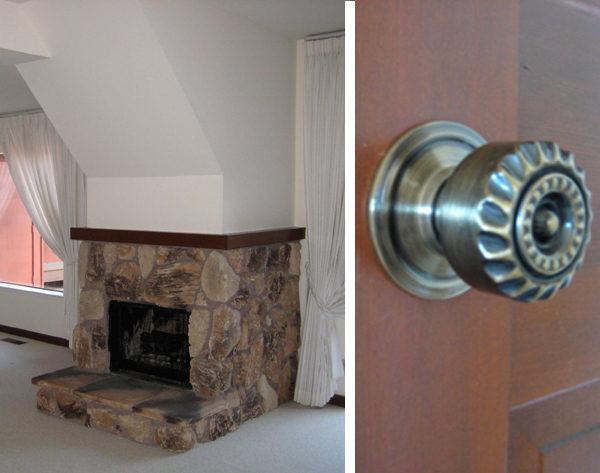 Typical doorknob throughout the house… Off the back of the house there’s an enclosed patio, with covered hot tub in the corner, kitchenette and bathroom. We think it’s pretty groovy, a nice private enclosed space (would love to have seen a party here in 1980), but definitely in need of updating. We’re opening it up quite a bit too. 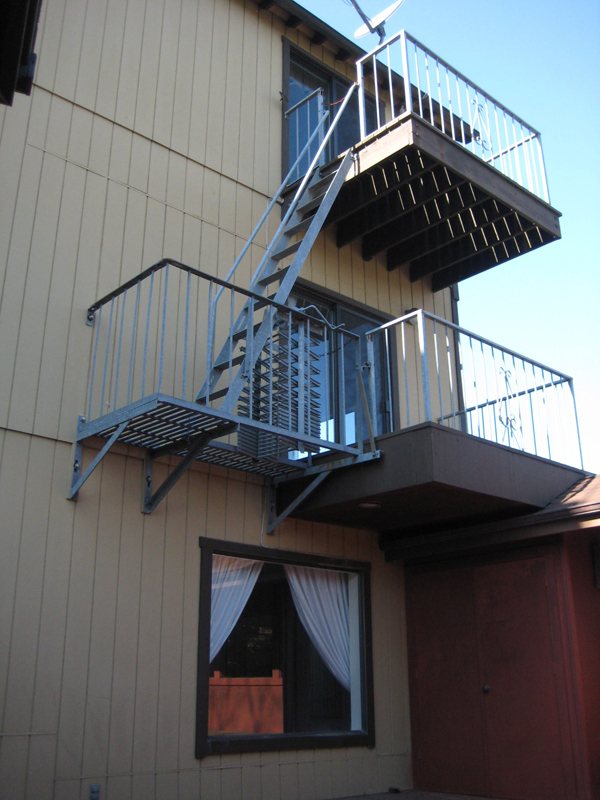 The dreaded fire escape, as seen from the patio. It’s a goner! 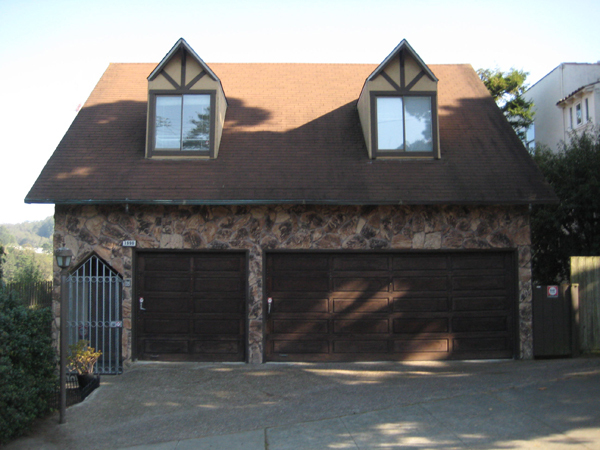 All these 70s treatments aside, the house has a lot of space, good bones, and sweeping views of the Marin Headlands and Twin Peaks – the reasons why the family bought it. 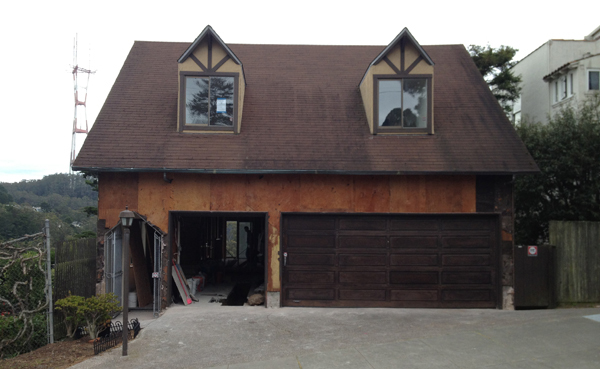 We’re well into demo now – check back for more progress….to the studs! These photos are actually a few weeks old, and much has happened since they were taken. 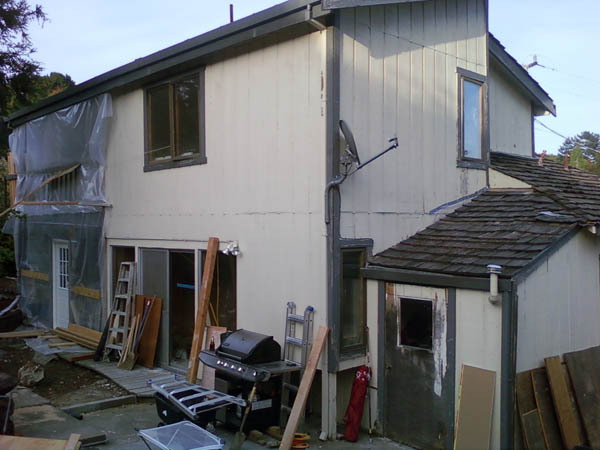 This is the rear side of the house which is being totally remodeled inside and out, including small additions at the front and rear as well. 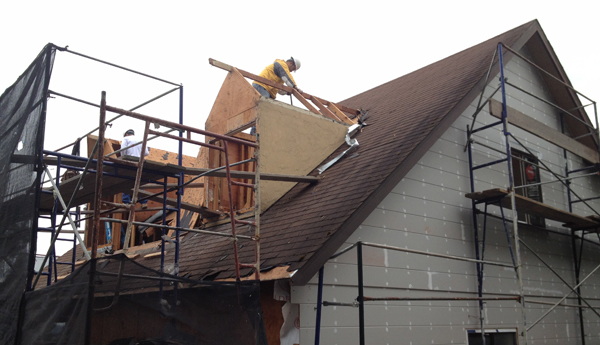 Note that this end of the house has an offset gable, so part of it is recessed – we’re extending it so it’s a flush wall. 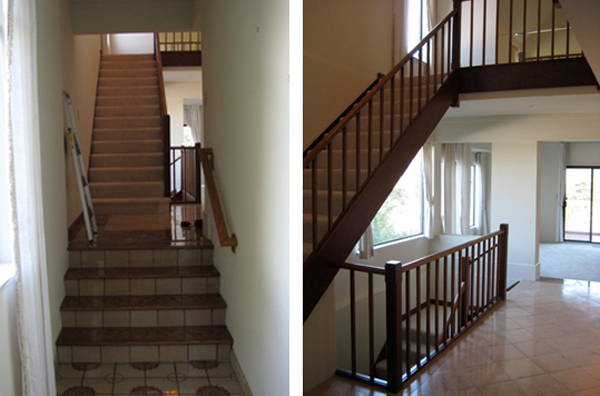 The stairs were formerly enclosed behind a wall. 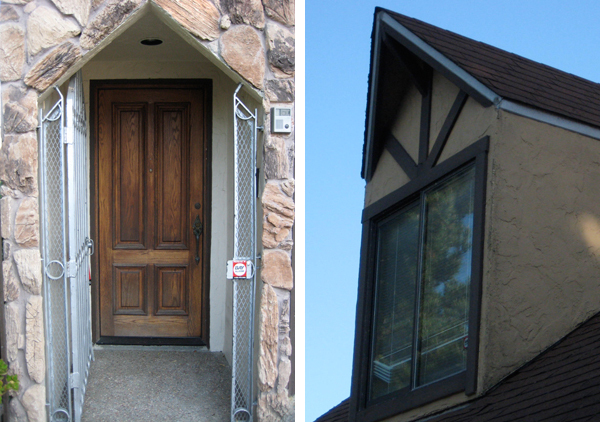 We widened them, they’ll have an open railing, and the windows will be revised to actually match the spaces. 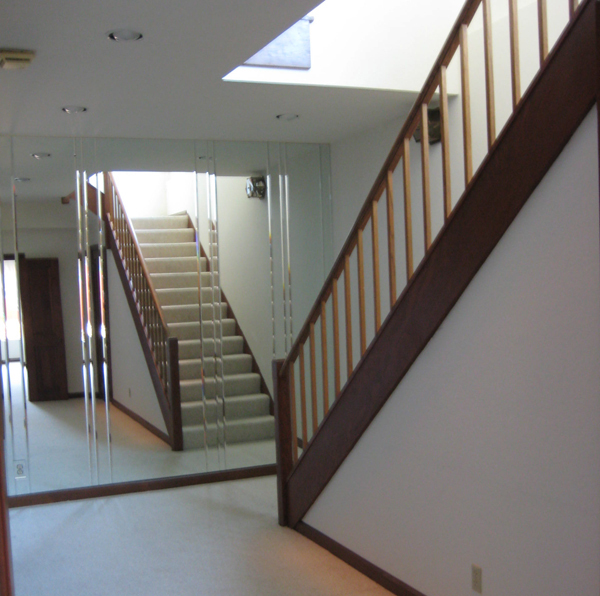 Below, the stairs are seen from the upper landing. 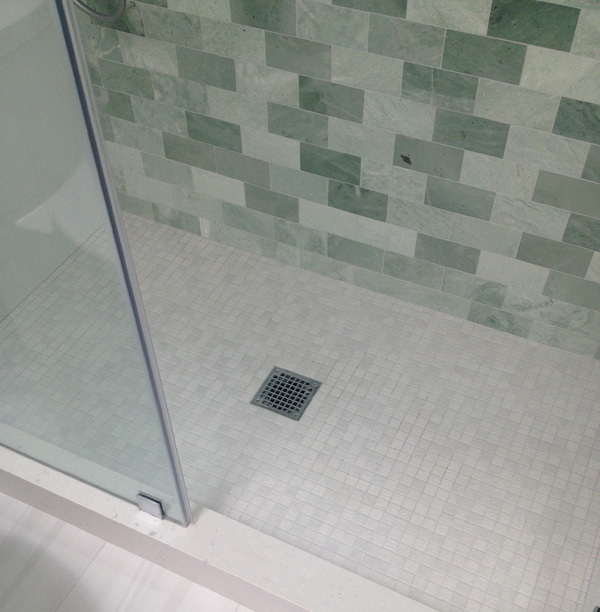 On left, the upper bathroom is being tiled in a 12×12 dark slate color tile. The family is living camping in the front half of the house, as much as they can, through construction. 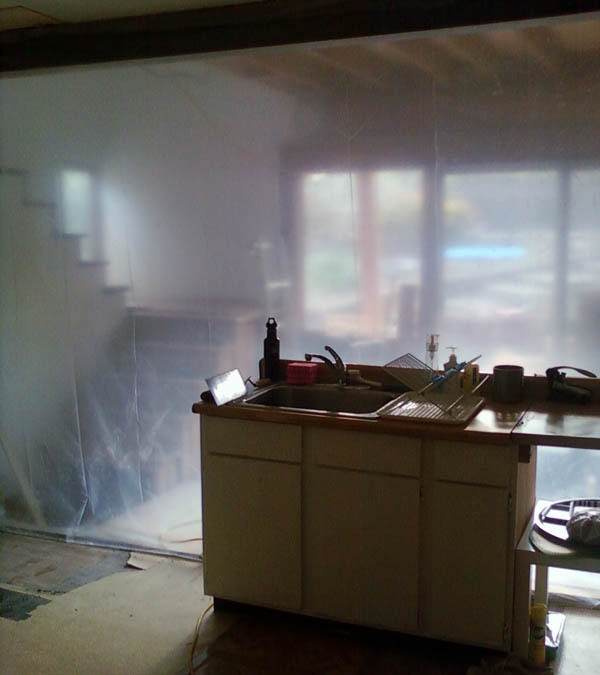 The remnant but usable pieces of the kitchen are just inside the plastic wall separating the construction zone. The new steel beam above allows the rooms at the back to be totally open. 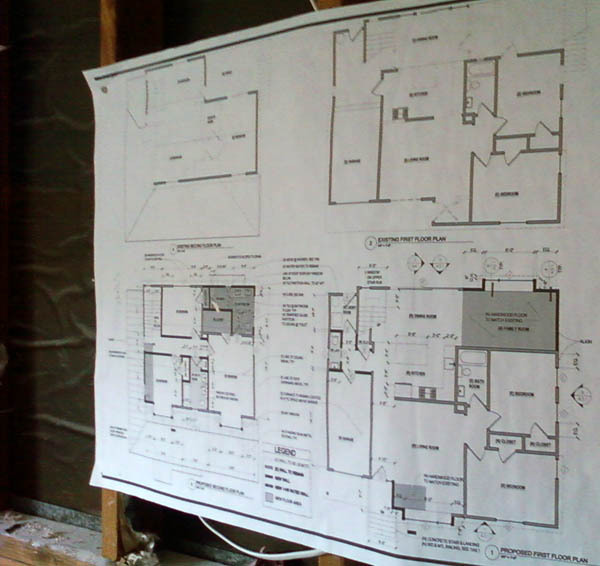 Floor plans showing the new areas being added in the shaded hatch. 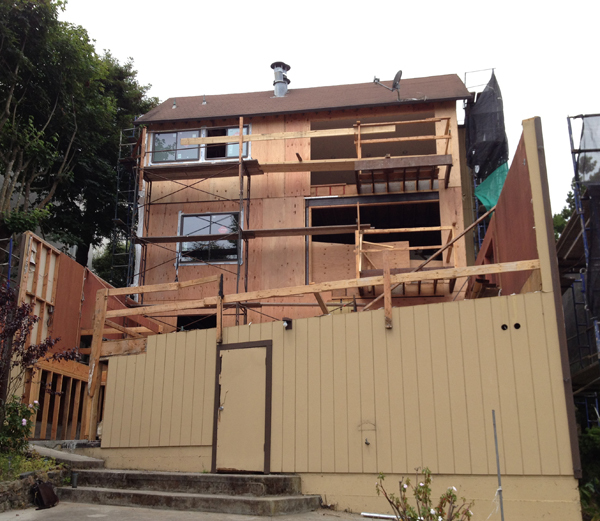 Large bay windows at the two front bedrooms aren’t hatched but they are new. More to come!